If you didn't manage to make to down to the Kraine theater over the past few days you missed the First Annual Rock Off Professional Wrestling Film Festival. Had I know what it was going to be like I would have made damn sure I could have attended more of the films. My trip to the festival was fraught with complications including my inability to find the theater. Actually had I not been told it was at KGB I would still be looking for it. Inside the small entry way was filled with the smell of popcorn. The organizers were right on target and providing free popcorn to ticket holders. Definitely a plus. When I went into the the theater wrestling music videos were playing on the screen. Since the footage was ECW matches I thought I had arrived late and missed the start of the film so I hustled to my seat. I hadn't missed anything and I had time to relax, unwind and chat briefly to the people around me, Everyone was friendly and talkative. The Kraine is a multi-purpose black box theater generally is used for regular theatrical performances. It has about 100 seats and is cozy with stadium seating. Wandering into the the theater for the first time with the video images and dim lights I suddenly was flashing back to the grindhouse days of old. This wasn't a legit theater but some old dive house back in the bad old days and for me it was like coming home. Before the film Mr C, Chocko and Hubert arrived enmass. They plopped down into seats and we waited for the movie to arrive. Mondocurry had said that he might make an appearance and he managed to arrive just as the film was introduced. BARBED WIRE CITY is an unauthorized look at the ECW. This was a more extreme wrestling organization that made its mark with violent and bloody matches that whipped the crowds into frenzies. 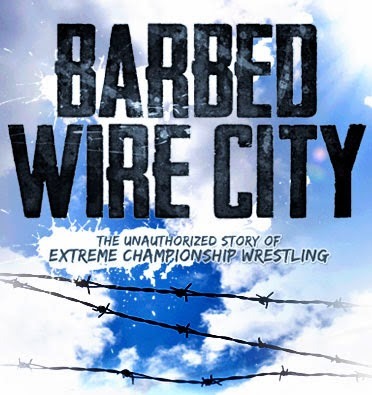 When the ECW shows played on cable TV they played late at night in many markets because they were so out there. An excellent documentary on the subject this is a film that will tell you everything you want to know about the once third biggest game in town. After the Q&A we all headed into the night. I had a family matter to take care of and everyone else had places to go. For my money I had a great time. I had such a good time that I emailed the festival to tell them so and to plead for a repeat next year. Honestly this was one of the best times I had at the movies all year and I want a chance to repeat it more time next year. Hopefully they'll repeat next year and I can keep it on my list of must attend NY film festivals.